In our Pocono ‘hot and not’ list MotorSportNotes picks the good and the bad from an eventful, entertaining and bittersweet ABC Supply 500, the penultimate race of the 2015 IndyCar series. Ryan has made a real habit of timing his 500-mile runs to perfection. In almost a carbon-copy of his Indy 500 win last season, Hunter-Reay kept his best until the final laps. Decisive but not overly aggressive moves throughout the race got him in to contention. 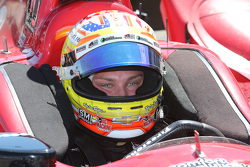 Even without the full course finish, the Andretti Autosport driver would have claimed the win. And in doing so Hunter-Reay proved that Honda have made progress since Indianapolis and deserve to be in contention for the championship next weekend. Not the fastest and not in contention for the win yet got back to his consistent best that frustrated his rivals for most of the seaon. With Rahal’s troubles and Dixon not able to convert Ganassi’s practice pace on race day, Montoya delivered an astute drive to maintain his points lead. The Colombian faced some hair-raising moments that could have sunk his day: narrowly missing Jack Hawksworth’s bouncing loose tire and not coming together with Tony Kanaan mid-race in the pits to name just a few. Safe navigation of those moments is as valuable as outright pace in IndyCar. Barring disasters at Sonoma next weekend, he is back in the box seat for the championship after a serious wobble in recent races. After the 1-2-3-4 at Iowa for American racers, you wondered if it was a flash in the pan. Hunter-Reay, Rahal, Newgarden, and Karam (prior to his shunt) proved decisively otherwise at Pocono. The IndyCar marketing man’s ‘dream championship’ win for Rahal has taken a hit after today. Despite that, the rise of Rahal, Newgarden and Karam this season will go some way to off set it if Rahal does not steal the title from Penske and Ganassi. Maximizing these drivers as marketable assets for the series is going to be very important. IndyCar’s track record in this regard is not great so fingers crossed they can put something together this time. It is not like they do not have a lot of off-season time to fill. A freak accident means we will remember this race for the wrong reasons as we await news on the former F1 driver. But for now let us remember this as another great performance from the Briton, showing his class amongst the Andretti regulars. The upturn in the performances of Honda and Andretti Autosport is in no small part due to Wilson’s input. 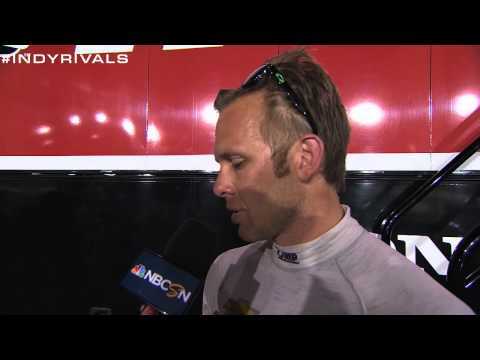 Just like Mid-Ohio this was another fine example of why Wilson deserves a full-time ride in IndyCar. There is just something about Bryan Herta’s team and 500-mile races. Chaves proved his ability, leading on pace and mixing it with the leading drivers. His elevation to the front was due to strategy yet the Colombian rookie was able to run convincingly at the front. Unlike his much-vaunted fellow rookie Karam, Chaves maintained that to the end of his race. Soured by the accident involving Justin Wilson but putting that to one side, Pocono offered another fabulous IndyCar race. Yes, there were too many caution periods as drivers treated early race re-starts like a green and white checker. On the upside the pre-race mutterings about too much ‘wash’ from cars making overtaking very difficult were, thankfully, inaccurate. The restart with 35 laps to go was insane – the scary prospect of seven-wide in to turn 1 looked very real for a few moments. Unlike Fontana, there was a pretty good crowd present to watch the racing too. Happy to lambast youngsters with fire in their belly and a will to win for questionable moves, yet comfortable to cut across and block James Jakes mid-race to cause yet another full-course caution. The clock should be ticking on Ed’s retirement from driving to focus on managing what is proving to be a great little IndyCar team. Tipped by MotorSportNotes as a potential interloper amongst the title protagonists for the win, Marco never looked like getting comfortable. Missing out on practice damaged his chances and the accident that ended his race pretty much summed up the day. Disappointing that he missed out on continuing his impeccable consistency in finishing every racing lap but his lack of front of the pack pace is a greater disappointment. From looking like he might at worst come away with a reduced gap to Montoya in the point standings, the pressure on the small RLL team took its toll. To add insult to injury, Tristan Vautier’s banzai move inside Rahal and Justin Wilson brought the American’s title challenge to a shuddering halt. Still in contention for the title with double-points but up against the likes of Dixon, Montoya and Power at Sonoma the team have their work cut out. Ok it is the end of the season and every driver needs to impress to keep or get a drive. Ok Pocono is wide and just begs for you to go three-wide. But it is not called the tricky triangle for nothing and throwing it up the inside on a road course is a very different matter to doing it at the 200mph plus Pocono Raceway. After some strong performances in previous races, this was one to forget for the former IndyLights champion (if Graham Rahal lets him). In our race preview we highlighted the risky game being played by Penske. By failing to align their challenge behind one or two of their four-car stable, they risk opening the door for Dixon and Rahal. 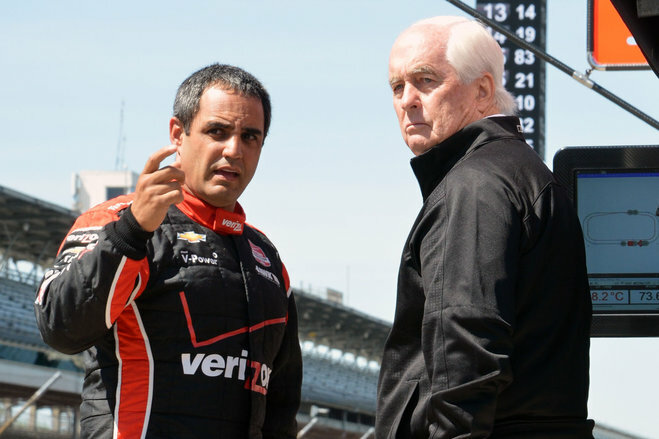 Rahal’s accident and – by their standards – the relative lack of speed from the Ganassi cars was a gimme for Penske. Whilst the challenge of three of their drivers remains (good) as they go to Sonoma, the problem still exists for Penske in fielding options for three drivers and how to maximize them during the season finale (bad). Rivals Ganassi and RLL Racing have one hope and one hope only for the title respectively. All their efforts will go to support their best title hopes at Sonoma whilst Penske will need to juggle three.